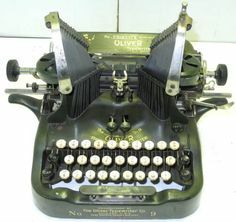 All in the line of research, I found an image of this carnivorous-looking typewriter, circa 1915. Writing is difficult enough, uncertain enough, and imagine if you had to be right up close to this scary thing hour after hour. Doesn’t it look like something about to bite you, with those pearly teeth and terrible jutting-out slitty eyes? I’m working on a new novel set about a century ago in East Tennessee, where I live now. My character is using a typewriter and I have made an executive decision that she will not be using this monster but one of the more benign models. I have to save her strength for troubles ahead.